how 'bout we all greeble an approximately 64 stud area, post a pic in the group pool, and we can all learn like any group study. Of course some people will learn more than others but we can still learn ideas. Good idea. I'll get around to it once I get home again (=in a few days). It's a fantastic idea but 64 studs!? I don't have that many greebly parts! Yeah, make it a 6 x 6 area instead. I assume that we are allowed to create the feeling of a hull on this area - not greeble it entirely. Like Hoffy did here. I assume that we are allowed to create the feeling of a hull on this area - not greeble it entirely. Like Hoffy did <a href="http://flickr.com/photos/95591421@N00/163672471/">here</a>. Yes, I do believe a 64 stud area (emphasis on area) would be 8 x 8 or 4 x 16, etc. I'm sure you have enough greeble parts for that. 8x8 isn't that hard. I might participate. yeah area. 8x8. not 64x64. lol. sounds good. I'll get on it first thing in the morning. how do I post the pic's? Tony: If you want to post the pictures like I did above, you have to use HTML. If you don't want to write the code yourself, go to the picture you want to post and click on "all sizes" above it. Choose your size (if you want to post it in a thread like this, the small size is probably preferable). Copy and paste the code in the box labelled with the number one, and there you go! If you want to post it to the pool, go to the photo in question and click on the "send to group"-button above it and select "classic-space". Edit: all of this requires that you have the pic in your photostream, naturally. Tony: If you want to post the pictures like I did above, you have to use HTML. If you don't want to write the code yourself, go to the picture you want to post and click on &quot;all sizes&quot; above it. Choose your size (if you want to post it in a thread like this, the small size is probably preferable). Copy and paste the code in the box labelled with the number one, and there you go! If you want to post it to the pool, go to the photo in question and click on the &quot;send to group&quot;-button above it and select &quot;classic-space&quot;. Hope that helped. Edit: all of this requires that you have the pic in your photostream, naturally. so I'm going to build some greebly study stuff in the next few days and post it here. thank's a lot Linus! so I'm going to build some greebly study stuff in the next few days and post it here. Good Idea. I'll see if I can squeeze in a block of time to put something together. I BUILT!!! Can you believe it? <a href="http://www.flickr.com/photos/lights/166720189/in/photostream/">I BUILT!! !</a> Can you believe it? No, now who did you pay to make that? redid mine. I'm surprised so many people are doing this. <a href="http://www.flickr.com/photos/95591421@N00/167263043/in/pool-classic-space/">www.flickr.com/photos/95591421@N00/167263043/in/pool-clas...</a> redid mine. I'm surprised so many people are doing this. Hey fellas! I tried to do a summary of lessons I have learned so far. I'm not posting it in two places though (my fingers are sore from all the writing ;-), but check it out here if you want. Hey fellas! I tried to do a summary of lessons I have learned so far. I'm not posting it in two places though (my fingers are sore from all the writing ;-), but check it out <a href="http://classic-space.com/plugins/forum/forum_viewtopic.php?28796">here</a> if you want. A couple more pics are here. 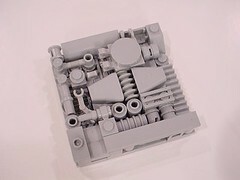 I built this within a day or two of hearing about the greeble study, but just last night got around to shooting pics. A little late, but here's mine: <img src="http://static.flickr.com/75/194866861_4320ea8d32_m.jpg" /> A couple more pics are <a href="http://www.flickr.com/photos/27076639@N00/tags/greebstudy/">here</a>. 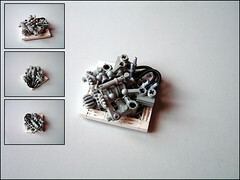 I built this within a day or two of hearing about the greeble study, but just last night got around to shooting pics. That thing with the worm gear and the car engine things is awesome.